TORONTO, April 20, 2018 – One of the more intriguing races of the 2018 Woodbine Thoroughbred season features a defending title-holding trainer looking for a repeat performance and a highly-accomplished Hall of Fame conditioner set for yet another strong campaign. Last season was undoubtedly a dream one for veteran Woodbine-based conditioner Norm McKnight. 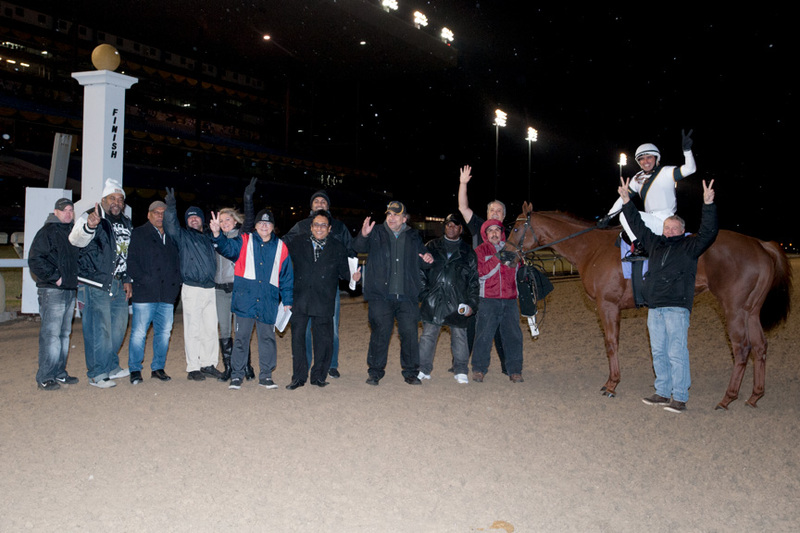 Aside from setting a slew of personal-best marks, including wins (99), earnings ($2.1 million) and win percentage (32.46 per cent), the former standardbred driver did what no one else had been able to accomplish in the past 10 years: he became the first person not named Mark Casse to win the Woodbine training title. McKnight, now in his 20th season as a conditioner, ended 2017 on a high note, winning five of the 14 races on the Toronto oval’s closing-day card to claim the title. Casse, one of North America’s most prolific trainers, was second to McKnight’s 99 wins with 96 victories. Trailing by one win heading into that Sunday after Casse notched a win on Saturday’s card, McKnight pulled even when Dan the Tin Man won the day’s second race. He pulled in front after the fifth race when Special Concoction went gate-to-wire. In the seventh, Reimagined found a seam late to notch a neck score. McKnight sewed up the title in the ninth when Sunny’s Rainbow made a trip to the winner’s circle. He added another win when Brews Toonie Toss took the 13th. Not a bad day at the oval. Did the man with 523 Woodbine career wins heading into Saturday’s opener see it coming? “Not really,” said McKnight. “I did think finishing second behind Mark would happen. So, I really hadn’t given it much thought heading into last year, getting too excited about winning. As we got closer, I thought, ‘Maybe we can do this.’ At the end of the day, I still thought it was quite a task. McKnight has great respect for Casse and his countless achievements. In order for McKnight to secure a second straight crown, he’ll once again have to go through one of the sport’s bona fide heavyweight champions, a trainer with an expansive (and ever expanding) trophy case, a stable of star horses, and a racing résumé that is the envy of many. Boasting 2,080 lifetime Woodbine wins – he has 2,450 in total as of April 18 – a small sample of Casse’s impressive accomplishments include 10 Sovereign Awards as Canada’s champion trainer and induction into the Canadian Horse Racing Hall of Fame in 2016. On May 14, 2016, he won his 2,000th race at Gulfstream Park, even though he was at Woodbine at the time. Top Casse horses of note over the years include Woodbine Mile, Breeders’ Cup and Queen Anne Stakes champ, Eclipse Award-winning Tepin, Pattison Canadian International and Breeders’ Cup turf champ World Approval (also an Eclipse winner), and Canadian Horses of the Year Sealy Hill, Uncaptured, Lexie Lou (2014 Queen’s Plate winner), Catch a Glimpse (also a Breeders’ Cup winner), Kaigun, Noble Bird and Pretty City Dancer. There’s plenty more stable power at his disposal. In search of a coveted Kentucky Derby triumph, Casse will send out Ontario-bred Flameaway in the Run for the Roses. The John Oxley-owned colt, who finished second in the Toyota Blue Grass Stakes, could possibly have a date in the Queen’s Plate (June 30), along with another Casse trainee, Telekinesis, a son of Ghostzapper, owned by Stonestreet Stables. They might not be the only two Casse entrants to line up in the starting gate. Casse holds the top four spots in the Queen’s Plate Winterbook: Telekinesis (4-1), along with Flameaway (5-1), Wonder Gadot (6-1) and Neepawa (8-1). McKnight, who finished second to Casse in the outstanding trainer Sovereign Award voting, was pleased to be recognized for his hard work throughout a memorable 2017 campaign. “We don’t have many horses eligible for the Sovereign Awards and that was simply because they didn’t qualify,” offered Casse. “You look at horses like Flameaway, World Approval and Road To Victory. They did good things for us. So, too does spreading the word about Canadian racing. This entry was posted in Woodbine News and tagged 2018 Queen's Plate, Horse Racing, Mark Casse, Norm McKnight, Opening Day, Queen's Plate, Thoroughbred Opening Day Event, Woodbine. Bookmark the permalink.